The Victoria Park is pictured at dockside. She was almost nailed by two German torpedoes one night in Rio de Janeiro Harbor during World War II. Photo provided. At 90 Al Gosselin of Big Tree mobile home park in Arcadia, Fla. no longer remembers all the details of the 10 trips he made across the Atlantic and Pacific as a radioman aboard six freighters and one landing craft he served on during World War II. But there are instances aboard ship he still recalls as clear as a bell. Even though he ended up in the Navy’s Armed Guard Service aboard civilian ships carrying cargo for the military during the war he couldn’t shoot straight. “They gave us shots, checked our teeth and gave us .22-caliber rifles to shoot in boot camp. It was the first time I ever held a firearm and I did so badly they said try again. I didn’t do any better the second time,” Gosselin recalled. It didn’t matter because he wound up in radio school. Sixteen weeks later he graduated a Radioman 3rd Class and went to sea. His battle station was the radio shack, not a gun aboard ship. “Our first trip was to Trinidad. We stopped in Cuba and Puerto Rico on the way down,” he said. “There must have been 1,000 radiomen, signalmen and gunner’s mates on board. The idea was down in Trinidad they had a pool of recruits and when they needed a radioman, signalman or gunner’s mate they would select one of us. “From Trinidad I sailed on a Canadian tanker to New York City with a load of oil on my first trip. On my second we sailed out of New York for London. We were in the Thames River moored at dockside in London when the Germans bombed the place. We were lucky and didn’t get hit,” Gosselin remembered. He made a couple of trips to Italy. 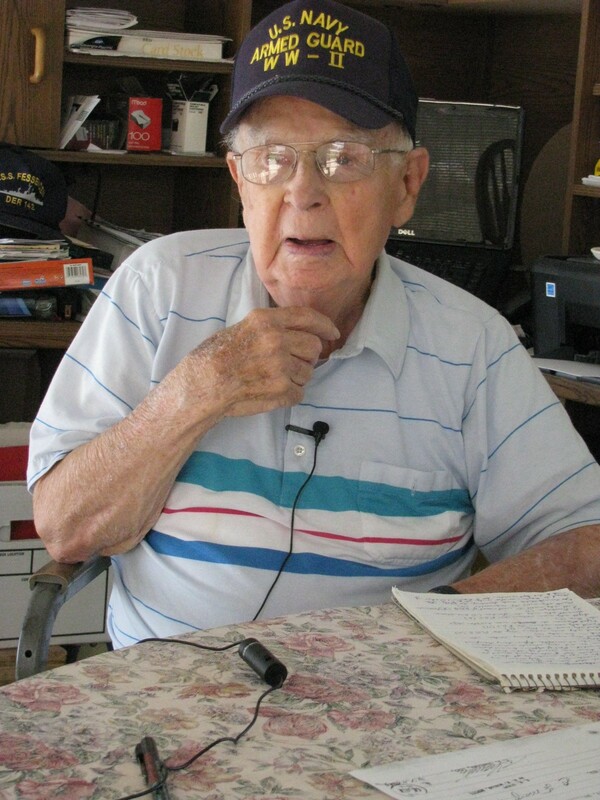 He recalls one to Naples where he met members of the 442nd Infantry Regiment. They were a Japanese-American unit that gained fame by this time for their heroics on the battlefield. “They were terrific fighters and they did a great job during the war,” he said. “After arriving in Naples three of us aboard ship decided to take a trip to Pisa to see the Leaning Tower. We thumbed our way part way there, but when we found out how much further we had to travel we turned around and went to Rome,” Gosselin said. “We met the pope in the plaza in front of the Vatican. I’m not Catholic, but one of my buddies was. He went down on one knee and kissed the pope’s ring,” he recalled more than six decades later. Among the voyages he made during the war were a couple to Rio de Janeiro, Brazil where German U-boats lurked. They could spot the torpedoes in the inky water at night by the phosphorescence spinning off the torpedo’s propellers that drove them through the water. Goesslin said this happened aboard the freighter SS Victoria Park when she was coming into port. But this wasn’t the worst of it. On a voyage aboard the SS Thomas Nelson sailing from Iran to Marseilles, France they lost the convoy they were traveling with and didn’t know where they were. “One morning when we woke up we couldn’t see the convoy. We were all by ourselves. We were in the Mediterranean but that’s about all we knew,” he said. “All of a sudden we saw land. The skipper called the signalman up on the bridge and asked, ‘Does anything look familiar?’ ‘No,’ came the signalman’s reply. 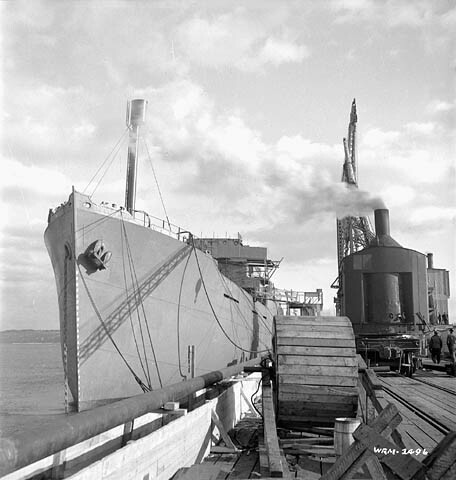 Before the war was over Gosselin would sail the Pacific aboard a landing craft, LCI-552. “It was fitted with 5-inch mortars. The idea was to lob 5-inch mortar rounds on the enemy when we got close to the beach during the invasion of the Japanese home islands,” he said. “We had just sailed out of Pearl Harbor when we got word they dropped the first Atomic Bomb. Three days later they dropped a second Atomic Bomb and the war was over. Gosselin’s records show he served as a radioman during World War II aboard the: SS Standard Arrow, SS Victoria Park, SS Fessenden, SS Thomas Nelson, SS Robert Luckenback and an LCI-552.He made 2 trips to France, 2 to Italy, 2 to Brazil, 1 to England, 1 to Haiti, 1 to the Philippines and 1 to Hawaii. When he was finally discharged from the Navy in January 1948 he returned to Boston and worked for more than 30 years as a TV repairman with a local company, He and his wife, Alice, have been married for 57 years. They have one daughter. This story first appeared in print on Monday, June 21, 2010 in the Charlotte Sun newspaper, Port Charlotte, Fla. and is republished on the web with permission. Click here to view Gosselin’s Collection in the Library of Congress’ Veterans History Project. ARCADIA, FL — Albert D. Gosselin, age 91, of Arcadia, Florida and Brookfield, NH, formerly of Saugus and Lynn, MA, died June 19, 2011, in Arcadia. He was the beloved husband of Alice (Brewer) Gosselin. Born and raised in Saugus; he was the son of the late Louis and Grace A. (Wiley) Gosselin. Albert was a graduate of Saugus High School, class of 1938. He was a veteran of the US Navy, having served in WWII aboard the USS Fessenden, and then serving in the Korean Conflict. He was honorably discharged as a Radioman 1st Class. Mr. Gosselin was employed as an appliance and TV repairman, and for many years, worked at the Boyd Corp. in Woburn. He resided in the Austin Square neighborhood of Lynn while raising his family. Upon retirement and for the past 28 years, he and his wife spent their summers in Brookfield, NH and wintered in Arcadia, FL. Mr. Gosselin was an avid ham radio operator and family photographer. His family and friends could count on him to fix anything. He loved people and had the knack of making you feel you were the most interesting and important person he knew. He was a member of the Saugus Sea Scouts, the Saugus Alumnae Association and the US Navy Armed Guard Association. He bowled in the Honeymooners Bowling League, the Lynn Church League and the Lynn Bowling League. He was a descendant and member of the Gabriel Gosselin Association whose family came from France to Canada in 1632. In addition to his wife, he is survived by his daughter, Diane Sharpe and her life partner Bernard Mazza of Gloucester; four grandchildren, Bethany Sharpe, Carissa Stewart, Timothy Sharpe and Bastian Mazza, and a niece Sandra Mears. He was the grandfather of the late Melinda Sharpe and brother of the late Ethel Hashem. Service Information: Visitation: Monday, June 27th, 9-10 a.m. at the First Church of Christ Congregational, 678 Lynnfield St., Lynn, with funeral service at 10 a.m. Burial with military honors on Monday at 3 p.m. at the Tibbetts Hill Cemetery, Brookfield, NH. In lieu of flowers, please make memorial gifts to the First Church of Christ Lynn or the Shriner’s Burn Center. Arrangements under the direction of Goodrich Funeral Home, 128 Washington St., Lynn.